To truly be a Saint, you have to be inclusive. Or, as Karen Diver puts it: "We haven't fully explored our Benedictine values if we haven't addressed inclusive excellence." Diver is the College's inaugural Faculty Fellow for Inclusive Excellence with a specialization in Native Studies. President Colette Geary, Ph.D., established the position in 2017 as a means to advance the College's ambitious strategic plan for inclusive excellence. "Engaging Karen Diver's broad expertise in Native affairs signifies the College's primacy of commitment in this inclusive excellence work to the local region and thus to tribal communities," Geary said. Diver is engaging faculty, staff and students in a variety of initiatives that emphasize student support, cultural fluency and overall inclusive teaching methods. She brings impressive credentials and an international reputation. She served the Obama White House as Special Assistant on Native American Affairs from November 2015 to January 2017. As a member of the Domestic Policy Council staff, she advised President Obama on issues affecting Indian Country. She was the first woman to serve as Chairwoman of the Fond du Lac Band of Lake Superior Chippewa, spending eight years in that role. She also served as Vice President of the Minnesota Chippewa Tribe and was a two-term Chair of the Boards of the Minnesota Council of Nonprofits and the Women's Foundation of Minnesota. She is in demand with indigenous rights groups around the world, speaking and consulting from Canada to New Zealand, from Mexico to Australia. Diver holds a bachelor's degree in Economics from the University of Minnesota Duluth, and a Master in Public Administration from the Kennedy School of Government at Harvard University. She said she's impressed that St. Scholastica created the position she occupies. "It's heartening to see an educational leader in the region build on its mission and values through a strategic vision for equity," she said. Working in higher education was not a career goal. But over the years Diver had been impressed with partnerships between St. Scholastica's Social Work and Nursing departments and Fond du Lac Tribal and Community College, as well as St. Scholastica alumni working as teachers of Ojibwe children in area K-12 schools. Since starting, she has put a lot of effort into what she calls "institutional readiness." She gives presentations about the historical and present-day relationships between the tribes and the U.S. federal government, "trying to develop a common base of knowledge." That has included coming in at 4 a.m. to offer training to the night facilities crew. "It's like, ‘You give me your people and I'll be there, whenever it needs to happen'," Diver said, "because it's important. We need to know we're all starting at the same place." Even among people of good will, there's ignorance about Native Americans, she said. "There are some key things people always bring up," she said. "Treaty rights and hunting and gathering, gaming, misperceptions around ‘everything's free - you get a free education.' We try to address those stereotypes in the training, and give historical context. People perceive wealth from the casinos, and think, ‘Why isn't everything all better with Indians?" Well, it fixes some stressors, but it doesn't fix others. There's an accumulation of historical and current trauma. I try to give people here at St. Scholastica an idea of what are the realistic barriers to getting Native learners here, and providing a learning environment that's successful. It's about creating that base of understanding so that when we start doing things perhaps a little differently, people understand why." 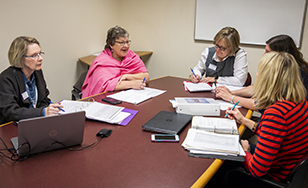 Building upon that training, she has conducted departmental follow-up meetings focusing on "very practical tips about interacting with the Native learner, and what do support systems look like. We're starting to make some of those institutional investments that will last." She is leading a revitalization of the Indian Studies department and the creation of interdisciplinary course offerings. The next phase is a "long-term investment" in positions to strengthen the College's Native curriculum and support staff. These include a Native Studies director position, an Ojibwe language and culture faculty member, and a Native "recruitment and success" staff member dedicated to following the Native learner from recruitment through matriculation. She's also working to "indigenize" classroom content. "I'm challenging the deans to know that Native learners need to not be invisible in curricula. Native learners shouldn't have to take an Indian Studies class to see themselves reflected. Every discipline can do it. Consider physical therapy. If you're recommending particular exercises, are you recommending those things that Native people tend to participate in more - gardening, or trail hiking, or berry picking, something like that - instead of just treadmills and fitness clubs?" She made science faculty aware of an ethno-botany guide that demonstrates how Native peoples have been using plants in medicine since long before contact with Western medicine. "Even just to mention this could mean a lot to a Native learner," she said. "A professor saying, ‘not all of this comes from a Western point of view, there are peoples all over the world who use plants for different purposes, and here are some ways indigenous peoples used botany.' Just mentioning that alone, tells that Native learner that she or he belongs in that classroom. That can make a world of difference in creating community for our Native learners." Diver sometimes humorously calls herself "just a bureaucrat" rather than an educator. When it's pointed out to her that she's educating people at St. Scholastica every day, she laughs. "Well, you really can't be a person of color in a largely majority (white) area or institution and not constantly be an educator. I come at it from being an advocate, rather than as an educator. It's about framing and giving background, and building understanding, and creating ally-ship, and that really doesn't change whether you're doing that in a political arena, a community engagement arena, or in higher education." She enjoys sharing her vision on campus. "I want people to support this work! It is the Benedictine values in action. The rest of the world doesn't look like northern Minnesota, so we do this not only to overcome inequity and disparities for Native learners and communities, but for the benefit of communities around us. How are they going to cope with change? How do we become more accepting and loving, and cherish the richness that difference brings, while celebrating the commonalities? Nothing could be more important. None of the rest of the work matters if we can't value one another. "It's about removing fear and instilling curiosity."